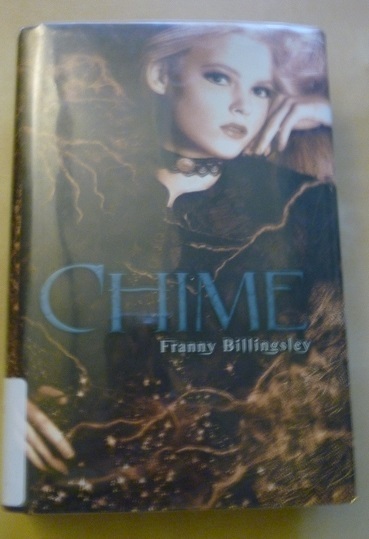 I’ve been hearing about Chime by Franny Billingsley for quite a while now. What finally drew me in to pick it up, though, was the opening line: “I’ve confessed to everything and I’d like to be hanged. Now, if you please.” So intriguing! What does it mean, what’s the story? Dark, but rousing my interest wonderfully. Well…the mystery was better than the solution. This was a good book but, as sometimes sadly happens, it was never quite as good as I hoped it would be. Since a lot of people really loved this one, my reaction may be a product of my waiting too long to read it, and building the whole idea up just a bit too much! Chime is narrated by Briony, who believes she’s a witch—Stepmother explained it to her. Briony has the Second Sight, the ability to see the wide variety of magical creatures living in the swamp outside her village. She believes that when she loses control of her temper, terrible things happen to the people around her—like the accident that left her twin sister Rose with the mind of a child, or the great wave that crippled Stepmother. Briony is careful to present a smiling mask to the world and to remember to hate herself and her wicked deeds—until she meets Eldric, who makes her wish witches could love. Briony should have been an intriguing character, and in some ways she is. The trouble is, while I grew to like her, I also got frustrated with her very quickly. Certain twists became obvious (to me) almost immediately, and I wanted to shake Briony for not figuring them out. Considering certain trauma she had been through, her inability to see was probably realistic and I acknowledge that—but that didn’t make it less frustrating to read. There are additional twists and revelations as the book goes on, some of them more unexpected, although most I worked out sooner than Briony did. That may be part of the fundamental problem of Briony’s character. She’s supposed to be very clever—but she doesn’t act that way. Briony and Eldric also felt consistently younger than they were supposed to be. To me, they often felt more like fourteen, instead of seventeen and twenty-two, respectively. I think Eldric was meant to be witty, and at times he was…but he came across as silly a bit too often. And I must say, having a man and a woman form a “Bad Boys Club” in the style of Tom Sawyer really doesn’t seem like the best of ideas for setting up an adult romance… There were some satisfying moments in the end, but it was rough in patches along the way. I did find the magic more effective, once I got into it. It was initially difficult to figure out the setting—there’s a strong New England and Salem Witch Trials feel to the little town, and since it’s supposed to be an (old country) English village in the early 1900s, that threw me some. But—once I got grounded, I did like the world of spooky, magical creatures in the swamp—everything from a Brownie to ghost children to a Dead Hand—and the ways the villagers had learned to deal with them. In some ways, Rose, Briony’s sister, became one of my favorite characters. She has more depth than was immediately apparent, and in her own obscure way, she really is clever. The book picked up as the action did and the second half is at least an engaging ride that ultimately presents some good twists. And there is a reason Briony wants to be hanged—now, if you please. Not a wonderful book—not a bad book—a pretty good book that almost might have done better with not quite such an intriguing opening. Perhaps I would have enjoyed it more expecting less! Chime is such an interesting book to discuss, especially because of Briony’s personality and narrative. For example, what you consider a fundamental problem is a corner stone in what makes Briony’s personality and the abuse she’s suffered believable (and relateable). If Billingsley had written a book where Briony were as clever as the text says she could be, she would be a radically different person. The plot would break too, of course, but that strikes me as an extension of the changes to Briony’s character. None of which makes her any less frustrating to read about, of course. I freely admit that I needed to struggle through the first half because I had similar issues. I just wanted to knock some sense into her because everything was so very obvious to me. But, as frustrating as it was to read, it’s also one of the reasons I liked the book so much when I read it and reacted so strongly to it. I recognise that feeling from trying to talk to some of my friends. Briony’s narration is one of (if not the) best portrayals of self-hatred and low self-esteem that I have ever read. It strikes me as a book that you very much need to read for the character development rather than the plot. The weakest bit for me was definitely the setting. Not the immediate area around Briony, but the way the larger world fit around it. It would have worked far better as secondary world fantasy for me because that moment we learn it’s set in an alternate version of our world was so jarring that it just threw me out of the story entirely. It didn’t suit the smaller setting she’d been building at all for me. Have you read her middle grade books? They’re much shorter, quicker reads. I like that she has such a unique style, especially with her descriptions and world building.